Buying a site and having your own house built is enough of a challenge. Designing the house and doing most of the building work yourself, in your spare time, while living on site, in a cold and damp caravan, with two children and a third on the way, while running your own busy architects practice would test most people. Add to this Kevin McCloud, a Grand Designs camera crew, and an audience of around 3.5 million people, eager to journey along the familiar narrative arc of, big dream, big budget, over budget, no contingency, late finish, happy or unhappy owner. 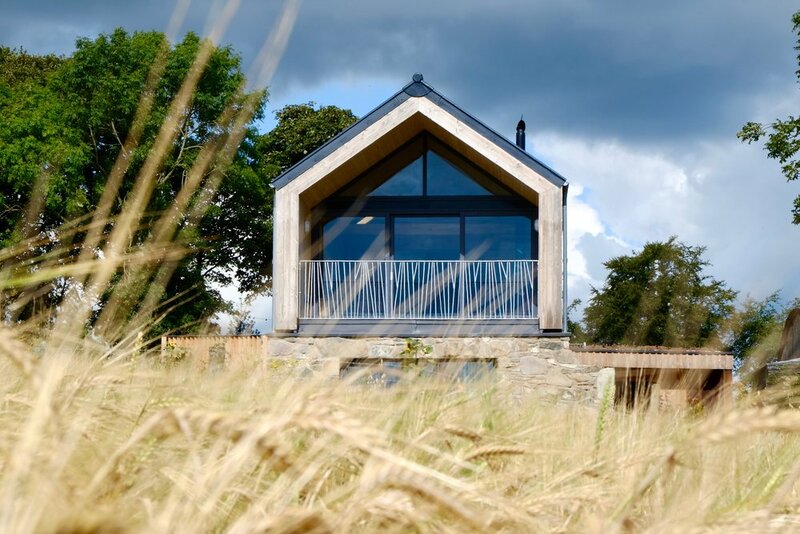 This is the story of the house that Elaine and Micah Jones built — a beautiful, timber clad, open plan, agricultural-barn-inspired ‘long house’; very much at home in the landscape of the gently rolling hills of Drumlins Co. Down. In many ways, life after Grand Designs has continued as normal. After the mad rush to meet the deadline, while bringing a newborn baby home to a building site and emptying the contents of the house into cardboard boxes in preparation for the final shoot; the camera crew leaves, the dust settles and, “you just want to get in and breathe for a bit” says Elaine. “To be honest if it wasn’t for being on Grand Designs we’d still be about halfway through finishing the project” adds Micah, as we take in the dramatic view from the full height living room window towards the snow-capped Mourne mountains. “The pressure of the television schedule meant that things got finished that may never have been.” For Elaine, her post-Grand Designs experience "has been thinking about how to live in this house — it’s what I was always looking forward to, working out where we want to put stuff and how daily life is going to work; which is fun”. But, there is also a new kind of ‘normal’ that life after Kevin as brought. There is a certain inevitability that being on a program as popular as Grand Designs would lead to a flurry of additional work for Micah. What isn’t a given is how he has chosen to deal with it. “I think there are some practices who have been on Grand Designs who go for growth rather than quality,” this doesn’t interest Micah who wants to focus on quality rather than quantity. "We don’t want to be like a fast-food style architecture practice where the quality is skin deep.” If this house is the measure of Micah’s current talents then he has little to worry about.